Mr B and I have made a good start on the baby, or 'the bean' as it's also known, room. It's our smaller bedroom, which had been my sewing room so firstly we'd had to get shelves up in the larger spare room for all my fabrics, trims and threads to live on. Done. So beans room is now stripped of it's woodchip (that stuff should be banned) filled, sanded and ready to paper. My mum had kept my cot, now 33 years old, so we spent some time sanding, washing and priming it ready to paint. Here it is, isn't it wonderful! I fancy painting it in something vibrant and retro, perhaps tomatoey orange or leafy green? I'll keep you posted. Myrtle watched on, assuming this is all being done for her benefit no doubt. 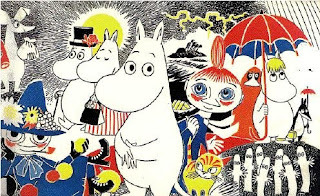 Youngsters rooms should be fun and expressive, rather than passive cocoons of beigeness.With this in mind we are painting Moomin designs on the walls. We both love the colours used in Tove Janssons illustrations and her references to nature, her stories are so creative. I like the fact that she was an artist who wrote. It gives a unique edge to her story telling where she ultimately demonstrates how the fear of the unknown (floods, comets and frosts) is conquered by the love and support of the Moomin family and their friends. Some may see the tales as dark but I see them as real and reassuring.